The McLaren MP4/8B was powered by a Lamborghini V12 and driven by Ayrton Senna in September, 1993 at Estoril after the Portuguese Grand Prix. It was faster, and he wanted to race it in Japan. That never happened. At some point earlier in 1993, Bob "Maximum" Lutz and Ron Dennis shook hands. Lutz was Chrysler's chief executive and Lamborghini was part of their portfolio since 1987. And while they already supplied the 'Lamborghini 3512' V12 to the Larrousse F1 team, he wanted to win races with it. He needed a top team for that, and Ron Dennis happened to have one. McLaren modified the MP4/8 mid-season in order for the bigger V12 (badged Chrysler for the tests) to fit instead of the Ford V8. It took them three month, but on the 20th of September, the MP4/8B hit Silverstone behind closed doors with Senna in the cockpit. He suggested to engine builder Mauro Forghieri that it would be better with a less brutal top end and a much fatter mid-range. The changes were made, and the V12 ended up having around 750 horsepower, still almost 70 more than the Cosworth Fords. It also proved more stable and easier on tires than the regular MP4/8. We are disappointed to say the least. We have worked very hard in the last few months, including a very intense period recently putting together a team to interface with McLaren and TAG Electronics. 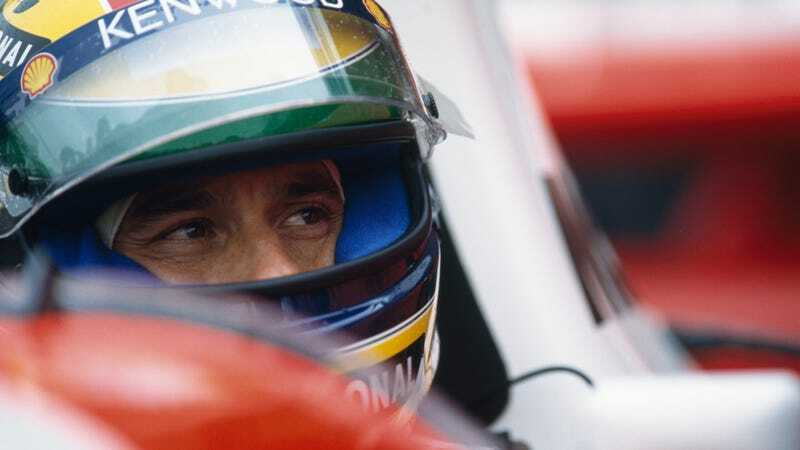 The car was very quick and Ayrton Senna said some encouraging things about it. There was a strong agreement to proceed together for the future. The decision may say something about F1. It's no secret that the marque must look at its costs, and we wanted to introduce our lean and efficient approach to it. Senna went on to win the two last races of the season with the Cosworth V8s (pictured below). The following year, he left McLaren to replace Prost at Williams. You know how that ended. For 1994, McLaren chose a Peugeot V10 over Lamborghini, creating the MP4/9, which scored no wins or poles and had an engine that liked to explode. Chrysler left F1 and sold Lamborghini to a bunch of Indonesians blaming poor Diablo sales in the US.